Earplugs that let sound in and keep water out. 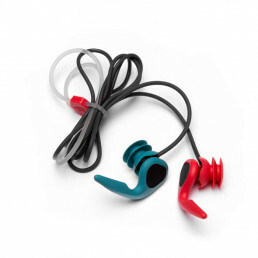 They come with changeable parts in different sizes that allow you to customize them for your ears in order to find a comfortable and secure fit. Keep your plugs in place. Comes in 2 sizes for custom fit. Shaped to boost acoustic performance and sealed with a mesh that protects you from the elements. Seals the ear canal in a comfortable and secure way. Comes in 4 sizes for custom fit. These ear plugs are great for surfing in cold water and avoiding getting bone growing over your earholes like some kind of horror movie earmuffs. 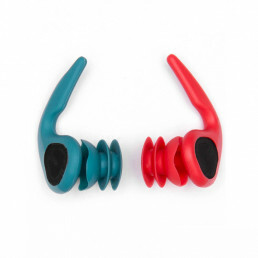 They are an alternative to putty or Blue Tac that fully seals off the ear but also fully seals off sound, making you anti-social yet giving you the ability to drop in and claim ‘oh sorry, mate, I didn’t hear you call out’. There’s also a few little adjustable bits in the pack, letting you get the kit without getting all angsty over which sizes to pick like other options on the market. There’s also a tether to pop around you neck in case they pop out of your ears and into the drink. A really neat touch is the two different colours of plugs. Red for your port-side (left) ear and green for your starboard (right) ear. A cool marine easter egg that will have sailors chuckling. Amazing. I didn’t even have to fiddle around with the different sized parts in the pack. I imagine that would be very, very annoying if you did. But, I didn’t have the experience. The standard size went in snug, with no wobbling or warbling. It is a great idea to offer different parts to adjust for small kiddy sized ears, or big whale blowholes too. That’s been a drawback of Doc’s Pro Plugs for me in the past. I simply found it too hard to figure out what size I was and was reluctant to put someone else’s wax covered plugs in my ears to find out. Again 10 out of 10. (I note it could be less if you’re forced to adjust these yourself with some hassle). My only small gripe with this. The ‘fixation wing’ on these ear plugs can take a little bit of fiddle farting around trying to click in place under the ridge in your ear. This is made harder if you’ve got cold fingers on a winter’s morning. The little neck cable can also get tangled up in the pouch, meaning you need to untangle things every time you surf like some rubbery set of Xmas lights. Both of these are fairly minor, but it’s something to note in a very close to perfect product. 8 out of 10. Oh lordy, these things are very comfortable. I already have wicked amounts of bone growth in both ears, even though I’ve already had one drilled a while back. That often makes it difficult to fit earplugs in and things get all crackly a poppy like Rice Bubbles if I’m wiggling around for a good fit. These went in easily, stayed comfortable without having to constantly adjust and generally felt excellent the entire time. The fact you can hear out of them really well also adds to the comfort factor. You barely feel like you have anything in there at all. 10 out of 10 here. Tighter than a narwhal’s pucker piece. There was no water flow in or out with these and my ear also stayed protected from the wind. The design of the earplugs meant the only thing not sealed out was sound, so, unfortunately, I had to listen to some grommets talking about how they were pulling sick airs on every wave and getting such deep barrels. Piss off piss ants, you wear bunny and shoulder hopping in equal measure. Stop trying to snake me and get in line behind the old fat guys with bones in their ears. 10 out of 10. 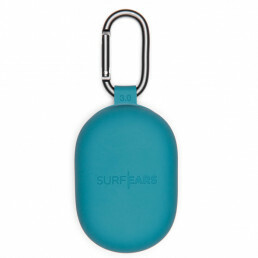 Finally, a pair of earplugs I’m happy to wear when surfing. SurfEars 3.0 are the best I’ve worn over the years and believe me, I’ve tried a lot of different kinds. They’re comfortable, seal out water and wind, yet let you hear people around you and give you a proper sense of balance in the lineup. The pouch is handy to keep in the car and keep sand and grit out and the different colours of earplugs are a neat touch. The only issue I have with these is that you have to fiddle a bit to get them properly in place and, because I’m lazy and just shove them back into the pouch, the neck attachment cable gets all tangled between surfs. Doubtless someone at SurfEars will email me and let me know how to store them away properly. I will also say that surfers ear is caused just as much from cold wind as water blowing over the general side of your head. So, it’s still probably best practice to wear a wetsuit hood to really reduce any bone growth. That is, if you’re happy to look like a dickhead with a rubber condom wrapped around your melon. The plugs aren’t something I’m going to wear every single surf, but when it’s cold, windy or my ears are playing up, I’ll have them in my car to use. If you want some good earplugs these are your number one stop. Get ‘em up ya. If you enjoyed this review you can visit our Product Reviews page for more, including a recent run of Winter Wetsuits. More Wetsuit reviews coming soon.